As a part of their ongoing customer engagement program, Fashion Bug provided an exciting opportunity to all loyal Reward Card holders as they were taken on a Whale Watching trip to Mirissa. 40 lucky winners were selected out of about 50,000 customers who qualified for the raffle draw. 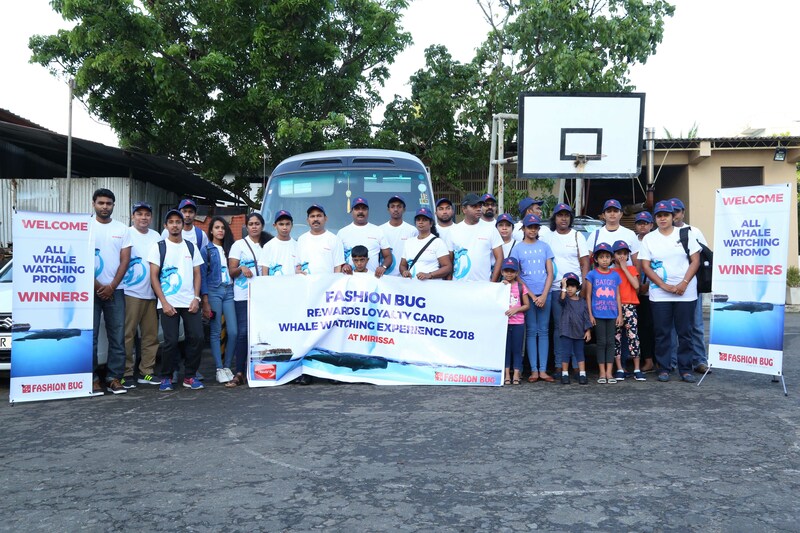 A group of 60, including winners and their family members and a few team members of Fashion Bug made the exciting journey on 8th December, departing from Galle in a Naval Vessel to Mirissa. The group was able to observe the largest mammals in their natural habitat, Whales as well as dolphins at Mirissa. It was a memorable outing for loyal customers who hailed from all parts of the island. Fashion Bug conducted the ‘Triple your points and win a free whale watching experience’ promotion during the September-October period and required loyal customers to maintain the required balance in their loyalty cards throughout the promo period. To facilitate the accumulation of points, customers were able to triple their reward points by shopping at any Fashion Bug outlet at the same time. Fashion Bug continuously carries out interesting customer engagement programs throughout the year to reward their loyal customers as maintaining customer relationship is a key focus for the brand. “We do not want to be just another retail store where people come to shop. Instead we want to build a community around Fashion Bug, which definitely includes our loyal customers. With this objective we have continued to nurture customer engagements at various levels,” stated Mr. Shabier Subian, Director Fashion Bug.